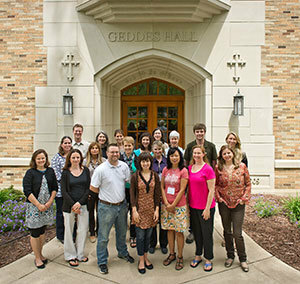 The second annual Center for Social Concerns Community Engagement Faculty Institute, held May 29 through May 31 (Wednesday through Friday) at the University of Notre Dame, was designed to help faculty deepen their understanding of the theory and practice of academic community engagement. Eighteen faculty and graduate students from numerous University organizations participated in the Faculty Institute. More than 40 campus and community experts presented over the three-day institute, augmenting daily readings on the scholarship of engagement, service learning, the pedagogy of reflective writing and community-based research. The three-day faculty institute was itself a model of engaged learning, featuring a mix of lectures by faculty and experts from several community partners on the theory and practice of community engagement, along with travel into the local community to learn with community partners who address a range of social concerns, such as poverty, health care and education. According to Mick, the Center for Social Concerns focuses on sustainable engagement that helps student, faculty and community development. Building strong, reciprocal relationships is key to sustainable engagement. The institute is designed to foster campus-community partnerships through site visits to partner organizations and by welcoming community partners on campus to discuss their role in community-based learning. Faculty learned from community partners about the care they take in facilitating strong orientation, placement, supervision and reflection as students work at their organizations. Faculty and staff with expertise as theorists and practitioners of engaged teaching and research underscored the importance of intra-campus dialogue and partnerships. Faculty and students who attended came from the Center for Social Concerns, the University Writing Program, the Kaneb Center for Teaching and Learning, the Spanish program and French and Francophone studies in the Department of Romance Languages and Literatures, First Year of Studies, Notre Dame extended Research Community, and the departments of Africana studies; chemistry and biochemistry; classics; education, schooling and society; English; physics; political science; psychology; peace studies; theology; and sociology. For more information on the Faculty Institute, visit blogs.nd.edu/community-engagement-faculty-institute. Faculty interested in joining the Institute next year should contact Mick at cmick@nd.edu. Originally published by John Guimond at news.nd.edu on June 18, 2013.